You can access a growing gallery of higher resolution images. 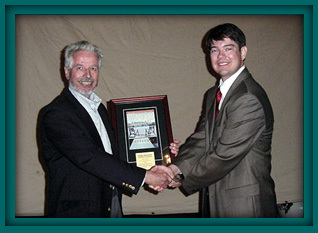 ECHO 2004: A Great Success! Need a Special Gift for the Holidays? Thank you to Ernestina's Volunteers! 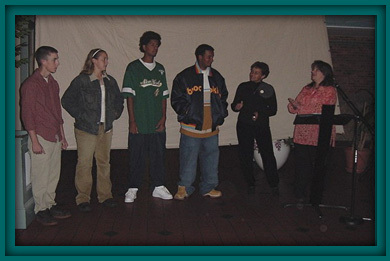 As a direct result of the funding available through ECHO, Schooner Ernestina provided 121 programs serving 5,723 persons from the southeastern Massachusetts region, primarily underserved youth from New Bedford and Fall River, with more than 17,984 contact hours of structured programming during July through October 2004. In addition, more than 661 volunteer hours were provided by several dozen volunteers. Twelve interns, youth 14 to 20 years old from the New Bedford community, successfully applied out of a pool of almost 50, and came board in teams of four for two week-stints to assist with the operation of the historic schooner and participate alongside the teaching staff in delivery of the ECHO program. The intern program included stipends for 960 hours of intern effort. A focused outreach effort led to programs for 32 different community-based organizations, 26 schools and nine college-based programs as well as 12 public sails open to the community at large. Louise Anthony worked with staff and ECHO partners on curriculum design for the Ocean Learning Program. She is shown here testing one of the stations on board the ship. 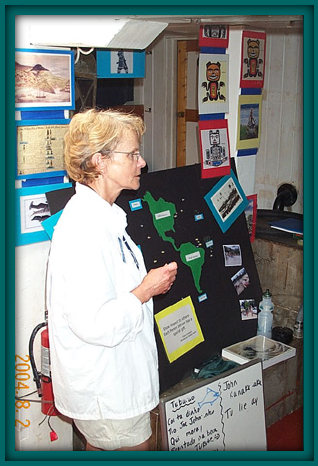 Our Ocean Learning Program Coordinator, Barbara Burgo, confirmed logistics and refined the way the program functioned. She outreached to many community-based organizations to fill more than 120 time slots throughout the season into the Fall. Outreach began in August to schools and other partners to fill the Fall schedule with many relationships already in place thanks to ongoing collaborations between the ECHO partners and the public schools. Ocean Learning Program Coordinator, Barbara Burgo, and Intern Program Coordinator, Laurie Weitzen, acknowledge the great effort by the ECHO Interns Fernando Gonsalves, Max DeOliveira, Katie DePrato and Kyle Miner. Not present for the end of the year celebration were other interns Jerrel Burgo, Jayme Diaz, Bryce Garron, Calvin Grace, Jeremy Lambalot, Wilson Pilarte, Brian Rudolph and Christian Turgeon. ECHO has provided a great opportunity! However, the challenge is rarely met with grant funding alone. You can help us make up the balance to cover our overall budget for the year. You can ensure Ernestina is under full sail with a generous donation today... If you would like to donate now, please click the image to the right to go to a secure server set up to handle online donations. Thank you in advance for your generosity! 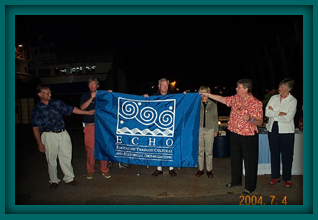 Anne Brengle presents a new ECHO banner to Ernestina on behalf of the Whaling Museum and the New Bedford Oceanarium just before the fireworks began in New Bedford Harbor on July 4th. NEW BEDFORD, MA – Earlier this year the New Bedford Whaling Museum and the New Bedford Oceanarium announced the creation of a joint local initiative to provide education, training and ocean learning experiences to SouthCoast students and teachers. 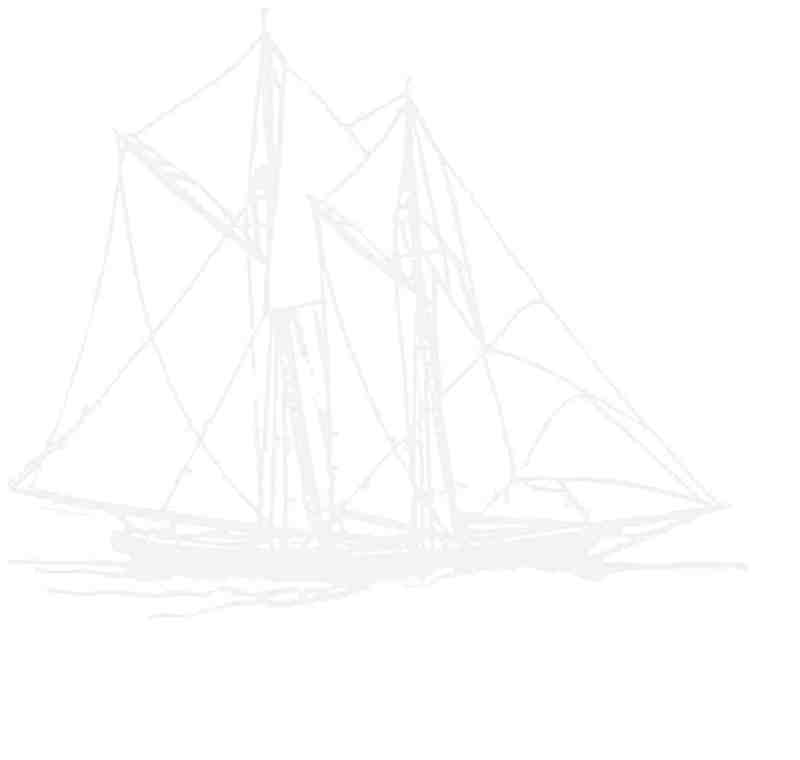 The “Sharing Cultures/Connecting Oceans: a New Bedford Collaboration” also involves the University of Massachusetts-Dartmouth, Schooner Ernestina and the New Bedford Global Learning Charter School. Funding, estimated at $695,000, has been appropriated through the Education through Cultural and Historical Organizations (ECHO) program of the U.S. Department of Education. The ECHO program links cultural organizations in Alaska, Hawaii, and Massachusetts in developing cultural and educational initiatives. The program’s goals are to build bridges to learn about local history, art and the natural environment by expanding the presence of cultural and historical organizations in the community; to celebrate cultural and ethnic diversity within historic coastal communities; to explore the connections among business, commerce, art, science and the natural environment; and to create new opportunities for teaching and learning. Established by Congress as part of the No Child Left Behind Act of 2001, ECHO is an educational and cultural enrichment initiative serving hundreds of thousands of children and adult learners in Alaska, Hawaii and Massachusetts. Working with local partners, such as the National Park Service, schools and community-based organizations, ECHO programs foster greater appreciation of local and national history and assist communities in maximizing the social benefits of new technology. The ECHO partners include the New Bedford Whaling Museum, New Bedford Oceanarium, Peabody Essex Museum, Bishop Museum in Hawaii, and the Alaska Native Heritage Center and Inupiat Heritage Center in Alaska. 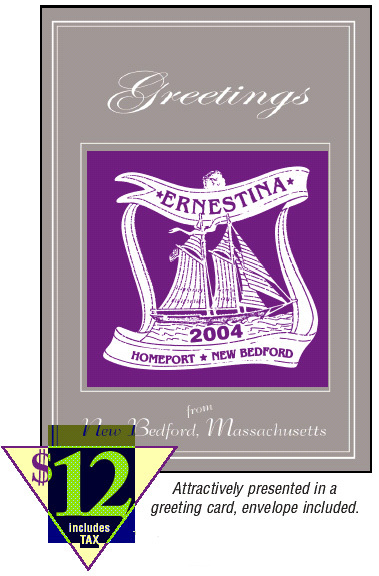 Ernestina operated out of our homeport of New Bedford for the sailing season offering daysail programs. NEED A SPECIAL GIFT FOR THE HOLIDAY? Is there a person on your Christmas or Hanukkah list who loves music? 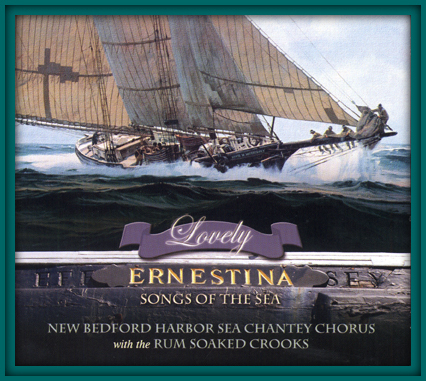 If so, please consider the CD "Lovely Ernestina and Songs of the Sea". This CD features the New Bedford Harbor Sea Chantey Chorus and the Rum Soaked Crooks. The cost is $15 and all proceeds benefit Schooner Ernestina. They are available here at the office and if you need shipping, the cost is $2. Best wishes for a happy holiday season! The proceeds from the sale of this ornament will be used to fund economic development activities in downtown New Bedford. A non-profit organization, Downtown New Bedford, Inc. is dedicated to stimulating downtown New Bedford’s growth and prosperity. $1 will be donated to the Schooner Ernestina for each ornament. Please download and print the order form and mail your request today! The rendering of the historic 2004 ornament was done by New Bedford area artist, Arthur Moniz, who has been painting New England scenery for more than 30 years. 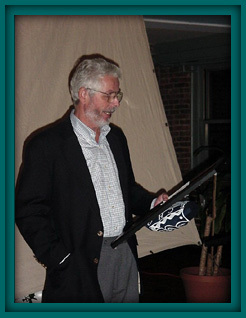 Ken Phillips from Yankee Publishing came from their headquarters in New Hampshire for Ernestina's End-of -the-Year Celebration to award Tony Cave the Barnraiser of the Year Award, a special recognition to persons who give their time generously for the causes they believe in. Tony has been instrumental in a behind the scenes effort to consider the potential for an endowment to support the Schooner Ernestina. Thank you so much, Tony! and congratulations from all of us at Ernestina. Our appreciation to Yankee Publishing for their thoughtful award. 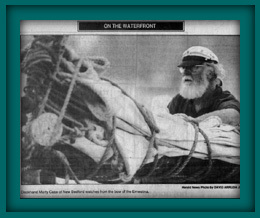 Marty Casey, longtime volunteer was featured in the Standard-Times, the regional paper in New Bedford, MA. 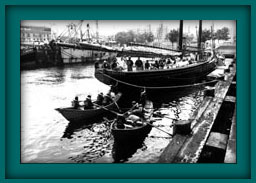 We want to thank the many volunteers who gave their time and support to the Schooner Ernestina during the 2004 Season!! Throughout the year, whether performing maintenance on the ship, helping to teach the educational programs underway, working to expand and interpret Ernestina's history, or stuffing envelopes in the office, volunteers could be found working alongside the Ernestinas professional staff. In every aspect of the organization, they were there, heartily contributing to the Ernestinas mission. This past year, we documented hundreds of hours of volunteer contributions. There will be more activities planned after the first of the year over the winter... Stay tuned! We are grateful to all the volunteers who helped Ernestina meet her ambitious programming goals this year, and would like thank them sincerely for all that they contribute. Their gift of time and talents are invaluable to us! Without even one person, no matter how many hours, the 2004 programs would not have been as successful as they were. Powerful learning moments... Which ones do you remember? A donation to the Schooner Ernestina Commission today will put students aboard. If you would like an on-line or mail-in form you can go to our membership page for details. Through Yankee's Community Partners, you can help support Schooner Ernestina. Subscribe for one year for only $20 and Yankee will donate $8 to Schooner Ernestina to put toward our fund-raising goals. For more information and to subscribe go to Yankee's website.